Affordable Skincare Solutions You Need To Try + Giveaway! Now I’ll be the first person to admit I have a bit of a thing for fancy skincare and makeup, if it’s expensive, the consumer in me instantly thinks ‘it must be good’ – and especially if it’s pretty, it’s most likely I’ll want to buy it. This is pretty ridiculous though, price does not necessarily indicate how good or effective a product will be, and how nice the packaging look definitely doesn’t reflect on what’s inside, it just entices us to make a purchase. So, this brings me on to Balance Active Formula products. This is a new brand to me, and I was surprised at their extensive range of skincare, as well as their very affordable prices. 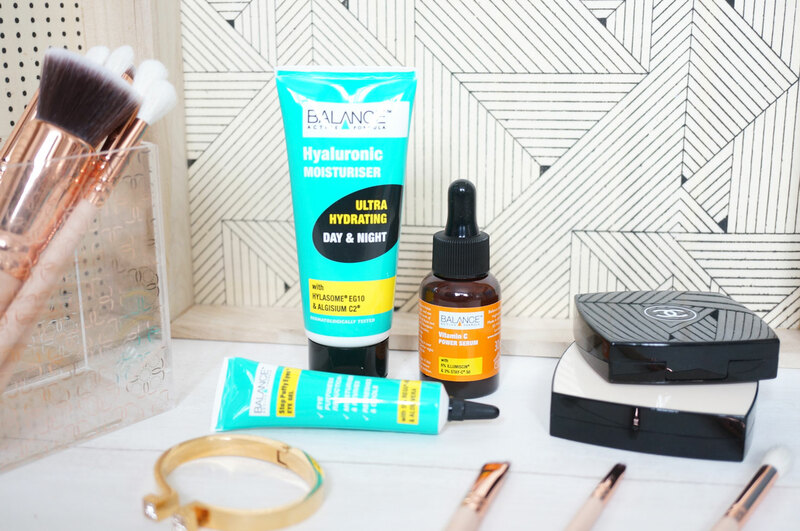 Balance Active Formula offers high performance skincare at realistic prices, and they use only the latest clinically proven ingredients to give visible results. It’s refreshing to see they don’t overprice their products to pay for expensive advertising and excessive packaging. These products can be purchased from a site called Beauty and the Bunch, which specialises in ‘bunching up’ beauty and skincare products so you can save money, rather than buying items singularly. Hyaluronic Moisturiser – this contains active levels of Algisium C2, a multi-functional skin perfecting ingredient, as well as Hylasome EG10, a powerful type of ultra-moisturising hyaluronic acid. Together they work to moisturise and even skin tone, improve radiance, reduce the appearance of fine lines and wrinkles and smooth skin’s texture. This is a lovely ultra-hydrating gel-cream product that soaks into my skin, leaving it feeling plump and refreshed. Stop Puffy Eyes Eye Gel – this is a refreshing and revitalising eye gel with Aloe Vera and active levels of REGU-AGE to help reduce the appearance of eye puffiness and fine lines. REGU®-AGE is an active complex of rice & soy peptides, and it’s clinically proven to help brighten the eye area and help reduce the appearance of eye puffiness & fine lines. I have a real problem with dark circles and puffy eye bags, so this product sounds perfect for me! The gel definitely feels cooling and refreshing on my eye area, I think I’m starting to see improvement in my eye puffiness, I’m hoping that longer use will bring even better results! Vitamin C Power Serum – this is a light-weight and non greasy pro-radiance serum that contains active levels of Illumiscin and Stay-C 50. The synergistic action of these two forms of stabilised Vitamin C plus Zinc PCA and Oleuropein results in reduced age-spots and a brighter, smoother more radiant and even toned complexion. Now I do love a serum, and this Vitamin C Serum is just fantastic. I’ve been using it on a daily basis and my skin has been feeling better all round, my complexion just looks more healthy and radiant. 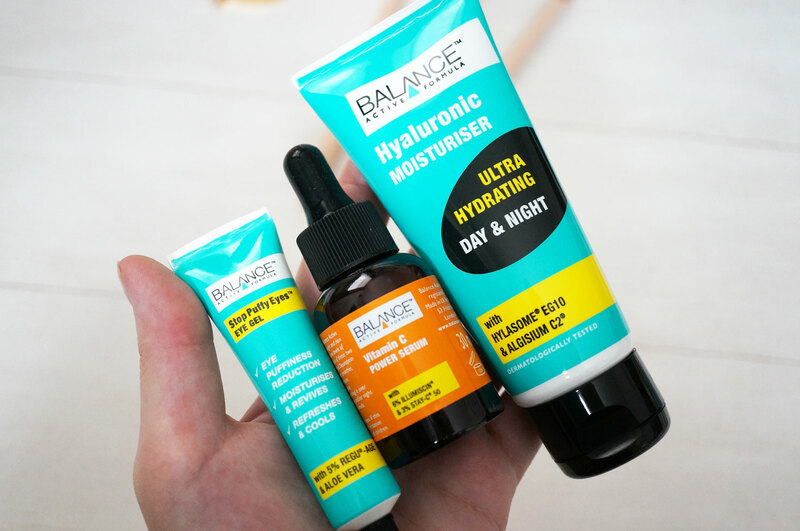 Beauty and the Bunch are also kindly giving away some of their Balance Active Formula bunches to you guys! There will be THREE winners in his giveaway, the first prize will be three beauty bunches of the winners choice, from any brand and at any price across the Beauty and the Bunch website. Second place will win two beauty bunches and third will win one beauty bunch. Next Post Gorgeous Stationery From Too Wrapped Up! Sounds excellent. Thanks for a great giveaway. How fun! Who doesn’t just LOVE a giveaway. And it sounds like these products are totally worth purchasing. Thanks for sharing! This is a great giveaway – the products look very good. Fa giveaway – I must try harder with skincare now I am properly old! Fun packaging! The eye gel sounds like one for me too. Would love to try these! I haven’t heard of the brand. What an awesome giveaway! I would love to try these! A great giveaway! Thank you!